A couple weeks ago I presented Danny with the idea of having another Rock Band party in honor of his birthday, which is coming up on May 7th and possibly having it catered. He was down with that (we are both big fans of the game since we love music so much) and liked the idea of having Mexican food since Cinco de Mayo is right before his birthday. So, this week I finally got the Evite sent out (if you are a friend of Dan’s and I missed you, let me know!). The party will be on May 3rd, and we are encouraging people to dress with a music theme like last time. Last time, I dressed as a glam rock groupie. For this party, I am going in a different direction. Like, totally! I am dressing like an 80’s pop star (a la Madonna and Cindy Lauper)! 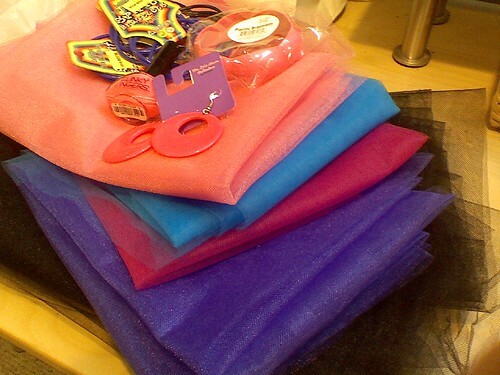 I have a mountain of tulle that was $1.50/yard in black, pinks, purple and an electric blue. I am going to make a tutu skirt out of it and wear footless tights with lace cuffs and bright pink socks. Nice. Now, I just need to figure out which shirt to order when I get the tights. Thanks to everything old being new again, I have some 80’s-inspired choices. I need your help! The skirt (and my tights) with be more black than anything else, though I’mnot sure how it will turn out. Bright pink is my main accent color. Please help me choose!